Parents with children cannot travel anonymously. They attract attention of others, whether it’s when they need help getting to the bus with a buggy or their child starts crying inconsolably. Parents know that in a public space they are watched and judged. But they judge others as well. Being responsible for a child’s safety and comfort, they carefully study every move of a stranger hanging around or trying to make contact. They keep a safe distance whenever they can. You can’t be too careful when it comes to your child’s safety. And then there is a public space, which is an issue itself. Commuting with a child is a strategic exercise. It’s like orienteering – you need to navigate the town to be able to meet all your child’s needs, be in a right place at the right time and accomplish the task which brought you out in the first place. 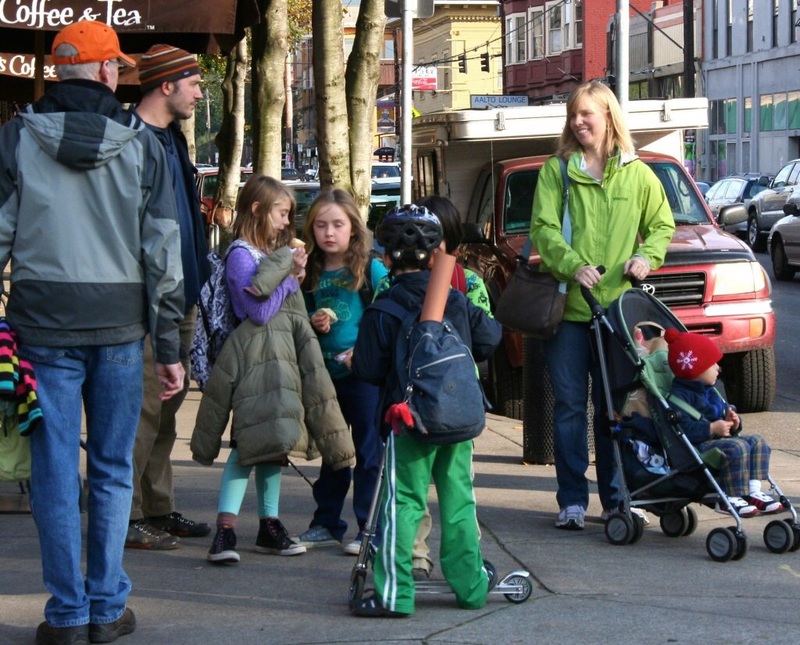 How we interact in public space is strongly shaped by our culture. The same applies to the way public space is designed and organised. It reflects the attitudes we as a society hold towards different social groups – the elderly, parents with children, cyclists, etc. I recently travelled by train with my two months old child and it was both physically challenging and emotionally difficult. Later on, when reflecting on this experience I realised that it exposes two aspects of parenting specific to our society. Being a parent in our society is an isolating experience. Children are solely their parents’ responsibility and if something goes ‘wrong’ in a public space, for example the child is temperamental, becomes noisy or too busy, overtired, parents might feel as if they are invading the public space and should immediately disappear. They may experience guilt, as if disrupting someone else’s peace was their fault. As parents are made to feel accountable for their children’s’ behaviour, we as a society prefer them to hang out in places designed for them, not interfering with our quieter, grown-up lives. Children aren’t treated as equal members of society, the same kids who will grow up to build its future. If they ‘misbehave’ in a public space it is not recognised as normal behaviour but instead a reflection of their parents’ disciplining abilities. Also, it is not in our code of behaviour to approach a parent with a child to offer a helping hand, i.e. hold the child for a moment when the parent is packing up. In todays world, when we hear so much about cases of abuse, kidnapping and other harm adults do to children – everyone becomes a suspect and the wariness became our default behaviour. It sometimes takes even the form of paranoia. In Galway, where I live, there is a Christmas Market every year. Last year I came across an appeal circulating on Facebook, written by a concerned mother who saw a man trying to catch and supposedly kidnap her daughter. The woman was advising others to be wary and have their eyes open at all times. A few days later, there was an update by the same woman ; police investigated the man and it turned out to be a grandfather mistaking the woman’s daughter for his grandchild. These days we know much more about cases of crime involving children, but the actual probability that something like this will happen to our child is still very small – as small as it was when children in my generation were walking to school by themselves. Therefore it is very strongly felt that parents are on their own – because they are the only ones responsible for their children and also, because it is dangerous to have different social arrangements. The sight of others watching parents in a public space is a harsh reminder of the judging of parental skills which take place every day. In our culture, parenting is defined as a set of skills which parents apply when interacting with their children. This is the reason why advising parents seems for so many people an obvious thing to do. It is then so easy to undermine parents’ confidence about their own way of doing things. People in social space often seem to have strong doubts about parenting skills of others. When I was rocking my son in the buggy, a man approached me and offered a piece of advice: ‘you can interact’ – he said – ‘if you wave your hand in front of him – like this – he will react’. I would like to ask people bringing this to the table, how many times in their lives has their romantic dinners actually been ruined by a family coming for a meal. I think this picture just shows the hostility towards parents and children in a public space, which supposedly does belong to others – mature and grown up people. This picture accounts for challenges which our society presents to parents and their children. This doesn’t mean that there are no positive exchanges and friendly people offering help or starting up nice conversations with parents. I described the ‘mutual distrust’ and common definition of ‘parenting as a set of skills’ to show that these aspects of parenting in our culture can be very undermining for parents and their confidence. It’s sometimes good to realise, that if we feel inadequate or uncomfortable in certain situation it’s not because we are wrong, but because the wider context is set up to make us feel like that. Knowing this we might be able to reject this role and follow our own path.